Please call 773-609-4401 for an appointment or click here. To give to Northern Illinois JFON, consider using one of the following means. If your local United Methodist church participates in the Rainbow Covenant, consider using the Rainbow Covenant number, 50000140. Consider using our Networking for Good page. It’s fast, safe, and convenient. Passionate about loving your neighbor? Want to impact someone’s life through the power of Christ? Please Get Involved! 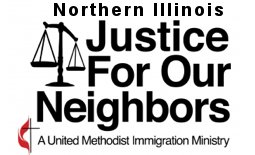 © 2019 Northern Illinois Justice For Our Neighbors. All Rights Reserved.